On April 9, 2012, Greg Garland, the designated CEO of Phillips 66, presented an overview of the new company and his plans for Phillips 66. There are three leading operating segments in the new company: Chemicals, Midstream, and Refining and Marketing. 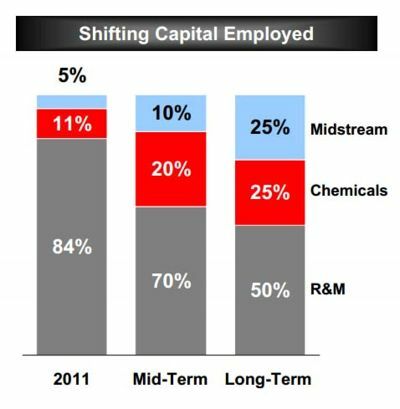 The basic Phillips 66 strategy to increase profitability is to focus on the business segments that have the highest return on capital invested which are the Chemical Business Segment and the Midstream Business Segment. This means that the Refining and Marketing Business Segment which has the lowest profitability will be de-emphasized. Capital allocations for the business segments with the highest profitability will be increased. Capital allocation for the R&M business segment will be reduced. Unprofitable refineries in the R&M Business Segment will be sold or closed. Ponca City falls into the Refining and Marketing business segment of Phillips 66. Garland talked about the benefits of Phillips 66 being an independent company. "As I think about the spin and really the strategy and the rationale behind the spin, it creates opportunity for Phillips 66 to create value that we just couldn't pursue as part of the integrated ConocoPhillips. Our existing R&M business, our Chemicals and Midstream business, all provide good, solid cash flow and we can use this cash flow to fund strategic growth. 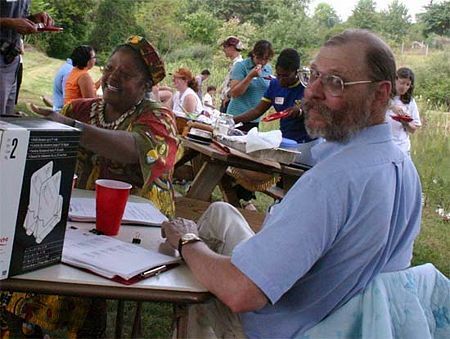 We can use it to improve returns, and also for distributions to shareholders. I think another benefit of the spin is you will see greater granularity regarding asset performance and the financial results in all three segments." Simon Moore wrote at Seeking Alpha on May 10, 2012 that ConocoPhillips was a slower, more lumbering entity but with Phillips 66 newly reduced size, its growth should accelerate. The Houston Business Journal reported on August 10, 2012 in a profile of Chevron Phillips CEO Pete Cella that with the ConocoPhillips split of its upstream and downstream business in May, Chevron Phillips makes up a more prominent part of the Phillips 66 business, which is good because the company gets more attention, said Cella. Laurie Winslow reported in the Tulsa World on October 3, 2012 that with Phillips 66 up 40.3 percent in the five months since its divestiture on May 1, 2012, the market has applauded the move by ConocoPhillips to split its exploration and production company from its refining business, creating Phillips 66. "In past years, refiners have been the dogs of the energy sector, and in 2012 they find themselves the darling of the energy sector. Phillips 66 really has spread its wings since the spinoff from ConocoPhillips, and it's gotten quite a bit of international attention," says Jake Dollarhide, CEO of Longbow Asset Management Co. "A lot of people felt that ConocoPhillips with all of the businesses together wasn't getting the market valuation it deserved." Greg Garland told investors and securities analysts at the 2012 Barclays CEO Energy-Power Conference in New York on September 5, 2012 that the three pieces of Phillips 66 business, the Refining and Marketing; the Midstream business, and the Chemicals business are more valuable together and that value is created through lower risk, lower cost of capital, the ability to see across the entire value chain. "We think we have a clear strategy in terms of capturing growth opportunities, margin enhancement opportunities, and driving return improvement in our business. I would also say that we are very purposeful and thoughtful. We're very purposeful and thoughtful about the assets that we've put in to Phillips 66 as we started the Company. We think that the three pieces of our business, the Refining and Marketing, Specialties, Transportation; the Midstream business, and the Chemicals business are more valuable together. We think value is created through lower risk, lower cost of capital, the ability to see across the entire value chain. We think it makes us better allocators of capital ultimately. We think you'll see the benefits of our management of these three businesses as we go forward." Greg Garland told investors and securities analysts at the 2012 Barclays CEO Energy-Power Conference in New York on September 5, 2012 that a differentiated portfolio is a competitive advantage for Phillips. "I would just say over the last 3.5 years, about 40% of our adjusted earnings came out of R&M or specifically refining. Then you can see 60% came out of marketing specialties and other businesses, our Chemicals business and Midstream business. The point here, we have a differentiated portfolio. We like this portfolio. We think it's a competitive advantage for us." ROCE (Return on Capital Employed) is a ratio used in finance, valuation, and accounting that compares earnings with capital invested in the company is used to prove the value the business gains from its assets and liabilities. The three operating segments of Phillips 66 have very different ROCE's. In 2011 the ROCE of the Refining and Marketing segment was 12%, the ROCE of the Midstream segment was 30%, and the ROCE of the Chemical segment was 28%. Because the ROCE of the Chemical segments and the Midstream segments is so much higher than the ROCE in the R&M segment, Garland plans to plans to aggressively grow the Chemicals and Midstream segments of Phillips 66 and de-emphasize the Refining and Marketing segments of the company. "Here's how we plan to enhance returns on capital," says Garland in the April9, 2012 financial analysts meeting. "I think you will see continued portfolio optimization, margin improvement from us. We will drive our capital employed to higher returning businesses. You can see on the chart on the right in 2012 we plan to high grade, to move more investment to Chemicals and Midstream. And by the way, these are our equity share of the investments in Chemicals and Midstream. While we're pursuing aggressive growth at both the DCP Midstream and the Chemicals Midstream, our view is that they're going to be self funding and at the same time they will dividend cash back to Phillips 66." Garland says that long-term Phillips 66 has "a vision that about 50% of our capital employed will be directed towards the R&M segment. And the other 50% will be directed towards Midstream and Chemicals.We'll preferentially invest in the higher return businesses and we will be very selective in how we invest in the lower return businesses." Garland told financial analysts at an investors conference on June 5, 2012 that Phillips 66 would keep investments in its refining assets to a minimum, instead focusing on expanding its chemical-and-logistics business and that Phillips 66 will spend $2 billion on capital projects in its midstream-logistics segment, including natural-gas-liquids processing and exports infrastructure. Molly Ryan reported in the Houston Business Journal on February 11, 2014 that Phillips' decision to move forward with more than $3 billion worth of projects reflects the company’s strategic decision to chase higher-margin markets. "Midstream spending is expected to pick up in 2014 since energy companies are increasingly realizing the profits that can be found in moving the massive amount of oil and gas coming from U.S. shale plays," writes Ryan. "Phillips 66 specifically hopes to cash in on this through its new liquefied petroleum gas terminal, which will store and transport fluids, and its new fractionator facility, which will supply and transport natural gas liquid products to petrochemical companies." Garland plans to aggressively grow the Chemicals and Midstream segments of Phillips 66 and de-emphasize the Refining and Marketing segments of the company. "Over the past three years we've reduced refining capacity about 450,000 barrels a day. In our Chemicals segment we've been growing primarily through investments in the Middle East. In our Midstream segment, growth has come from expansions around the shale liquids and gas producing areas." "The refining business is currently a difficult business and one where the outlook doesn't change a lot going forward," said Mark Gilman, an independent oil and gas analyst. "Phillips 66's asset quality in the refining space is, at best, kind of average." The best performing divisions for Phillips 66 are expected to be its midstream joint venture and a petrochemicals company. Simon Moore wrote on Seeking Alpha on May 10, 2012 that now that Phillips 66 is no longer part of ConocoPhillips, management is planning a clear cut move to greater emphasis on Midstream and Chemicals Business Segments. "New management's long term plan is to move to 50% Refining and Marketing, 25% Chemicals, and 25% Midstream. These latter two businesses have a much higher ROCE (return on capital employed) for PSX." ↑ Houston Business Journal. "Day in the Life with Pete Cella of Chevron Phillips Chemical Company" August 10, 2012. ↑ Tulsa World. "Tulsa Index stocks surge in third quarter" by Laurie Winslow. October 3, 2012. ↑ Wikipedia. "Return on capital employed" retrieved Arpil 23, 2012. ↑ Fox News. "Phillips 66 CEO Says Decision on Louisiana Refinery Will Come in Summer: June 5, 2012. ↑ Houston Business Journals. "Phillips 66’s new investments represent shift from refining to promise of high-margin markets" by Molly Ryan. February 11, 2013. ↑ Houston Chronicle. "ConocoPhillips split becomes official as company 'shrinks to grow'" by Simone Sebastian and Emily Pickrell. April 30, 2012. This page was last modified on 17 April 2014, at 12:09.